The researchers published their findings in the Canadian Journal of Earth Sciences. The dinosaur was about 20 feet in length and weighed more than 2 tons. It’s the oldest known large-bodied ceratopsian from Canada. 80 million years ago, during the Late Cretaceous Period, cerotopsian dinosaurs in North America underwent an evolutionary explosion, states Michael Ryan, curator of vertebrate paleontology at The Cleveland Museum of Natural History and lead author. X. foremostensis shows that even the oldest ceratopsids had massive spikes on their head shields and that their cranial ornamentation would only become more elaborate as new species evolved. 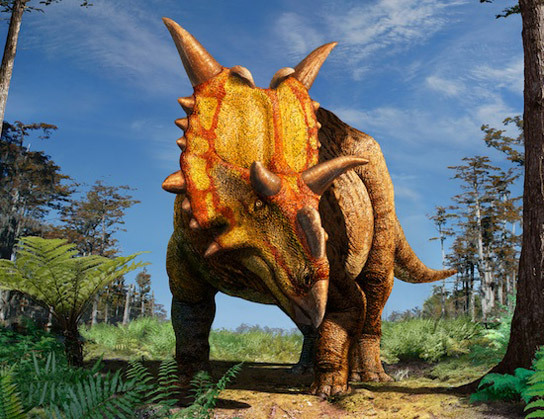 The name Xenoceratops means alien-horned face, referring to the strange pattern of horns on its head and the scarcity of horned dinosaur fossils from this part of the fossil record. Foremostensis honors the Village of Foremost, located close to where they dinosaur was discovered. X. foremonstensis had a parrot-like beak with long brow horns. There was a large frill protruding from the back of its skull featuring two big spikes. X. foremonstensis provides new information on the early evolution of ceratopsids, who aren’t that prevalent in the early fossil record. The new dinosaur was described from skull fragments from at least three individuals from the Foremost Formation. It’s currently housed in the Canadian Museum of Nature in Ottawa. The researchers stumbled upon the undescribed material more than a decade ago. They recognized a new type of horned dinosaur, and later discovered a 50-year old plaster jacket at the museum containing more skull bones from the same fossil locality. Be the first to comment on "Xenoceratops, A New Species of Horned Dinosaur Discovered in Canada"